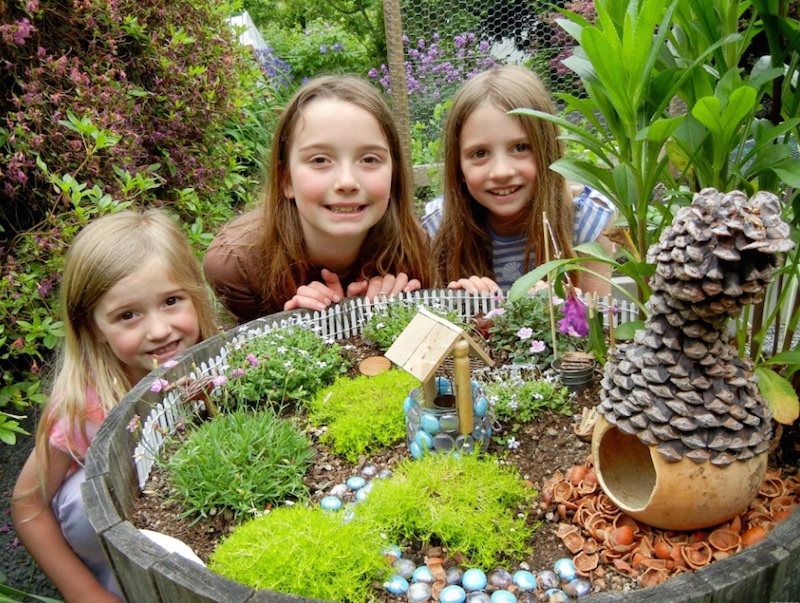 Creating a fairy house or garden is a surefire way to get kids outside. Little ones will love these creative and charming abodes, which spark imaginative play and an appreciation for the surrounding world. 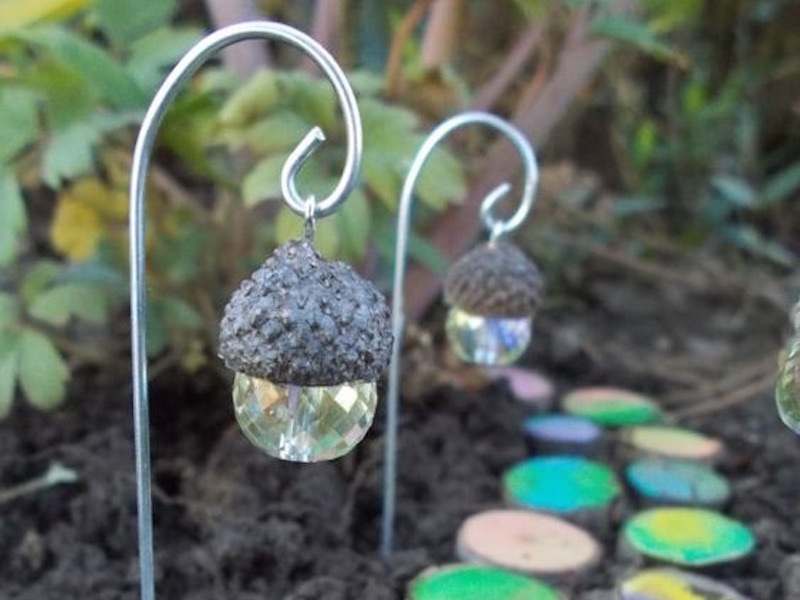 Fairy gardens and houses can be constructed from a variety of materials, including old flower pots and even upcycled plastic bottles, as well as simply bought. 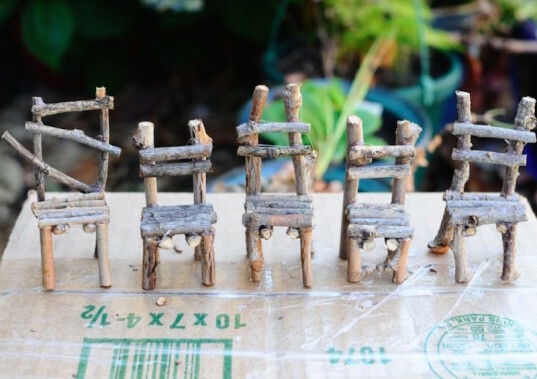 Crafty kids and parents can use these 9 ideas to make their own tiny furniture pieces and diminutive decorations. Tots are used to living in a grown-up, big world (and they're not always happy with being the smallest). Fairy houses allow them to dote on a smaller, albeit make-believe species. 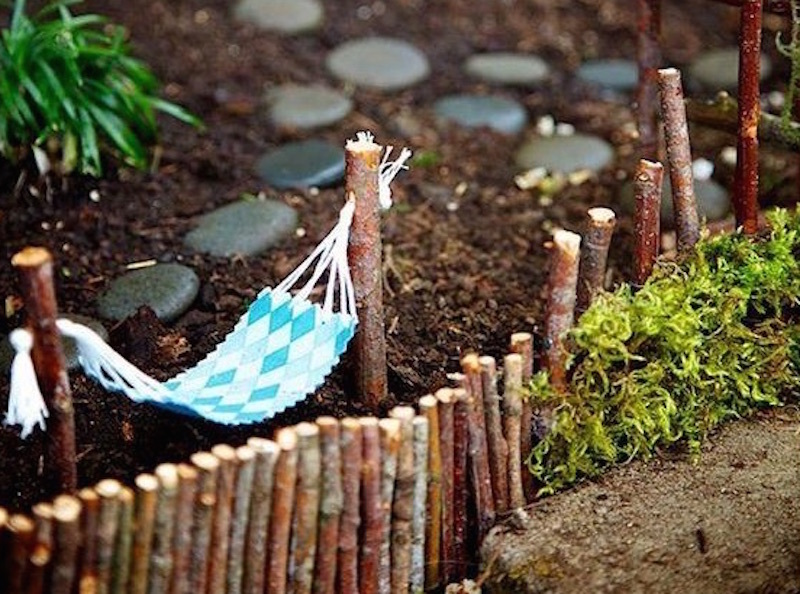 These magical touches will get your family started on the fairy garden life! Can fairies see in the dark? No need to worry: these sweet walkway “lights” will guide them safely home. All they require are acorn tops, sparkly beads or balls, and some wire. We also love the multicolored path made from tree rounds. There’s a lot to gain inspiration from here: the darling bunting in the background, the wooden door crafted from twigs and decorated with a twine wreath, a simple stone pathway, even mini landscape design elements. A dreamy, cozy home fit for the naturally minded fairy. We can see our kids wanting to make scores of these for all their little fairy friends. We’re happy to oblige since they require minimal materials: twigs and a hot glue gun. They are also sturdy enough for other dolls or miniatures to take a rest. 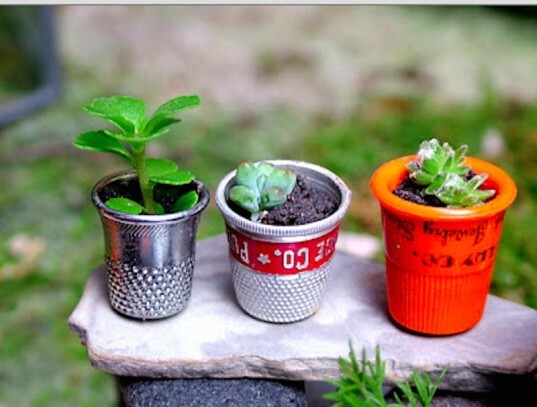 These teeny garden pots (thimbles!) are almost too cute for words; the only things cuter are the tiny succulents that actually fit inside them! Even fairies like a little shelter when they are playing or napping outside. 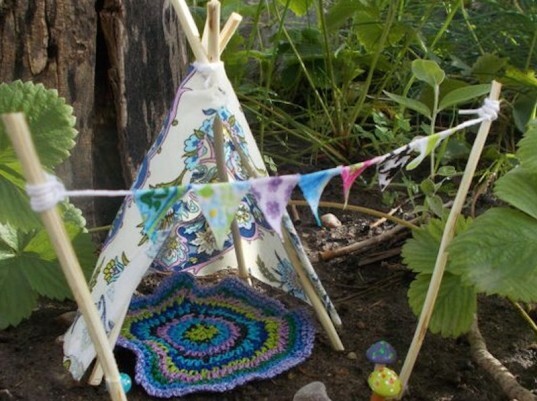 This teepee is too sweet; it makes great use of leftover sewing scraps. Knitters or crocheters could make a tiny rug for extra comfort. What a perfect use for a lone car or truck wheel! 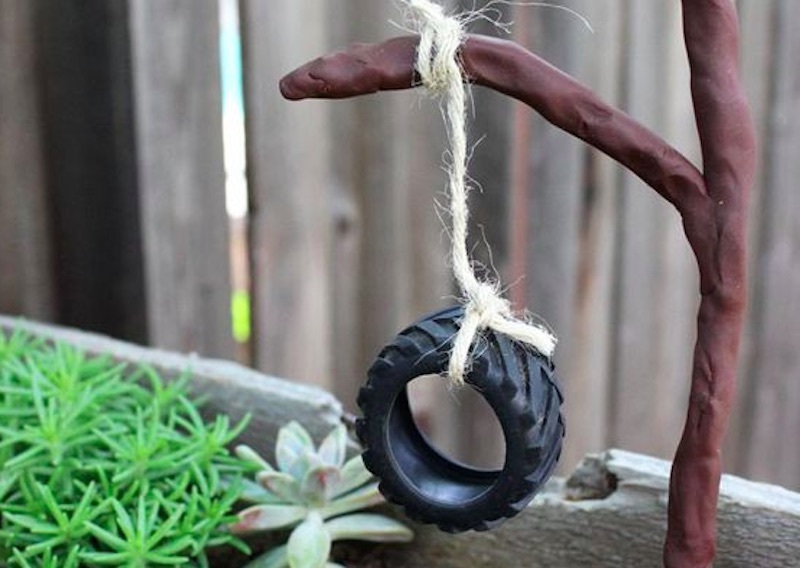 This fairy garden creator crafted a tree from Fimo (a type of modeling clay), but you could easily attach it to an existing twig or branch as well. Perhaps your garden fairy has mermaid dreams. These crafty chairs and table will make you glad you lugged home buckets full of ocean goodies from your last beach trip. We’ve also seen shells used for bathtubs, sinks, even fountains. When you ask a fairy if she’d like a “spot of tea,” you’ll really mean it: you can’t fit much more than a drop in this simply genius tea set. Kids will love dreaming up all the flavors they can serve from dandelion to basil-sunflower to (my kids’ favorite) clover stew. If only making hammocks for humans was this easy. Again, all you need are a few sewing scraps and some string (or even strong dental floss) to create a lazy day hangout for fairy friends. Looking for a super fun, fairy-inspired family activity? 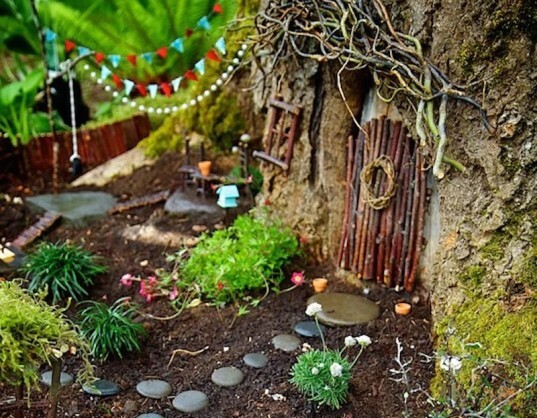 Enter the 2016 Fairy Garden Contest hosted by The Magic Onions and www.Fairygardens.com. Can fairies see in the dark? No need to worry: these sweet walkway "lights" will guide them safely home. 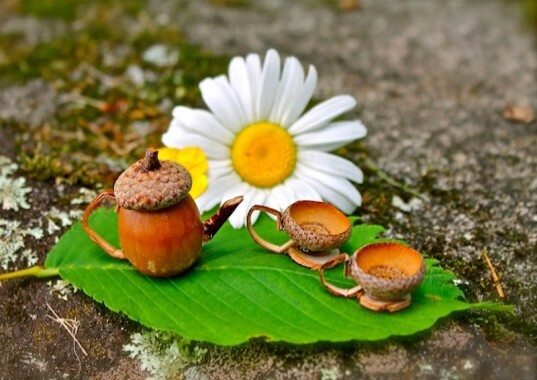 All they require are acorn tops, sparkly beads or balls, and some wire. We also love the multicolored path made from tree rounds. There's a lot to gain inspiration from here: the darling bunting in the background, the wooden door crafted from twigs and decorated with a twine wreath, a simple stone pathway, even mini landscape design elements. A dreamy, cozy home fit for the naturally minded fairy. We can see our kids wanting to make scores of these for all their little fairy friends. We're happy to oblige since they require minimal materials: twigs and a hot glue gun. They are also sturdy enough for other dolls or miniatures to take a rest. 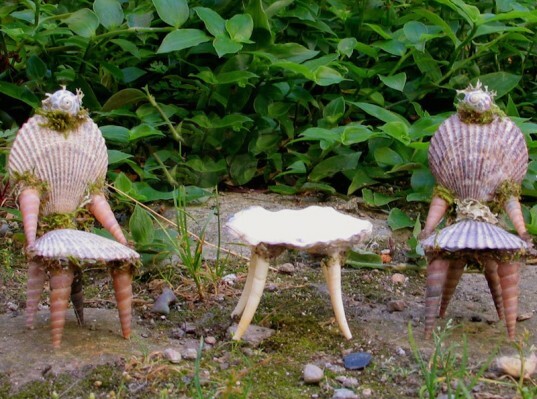 Perhaps your garden fairy has mermaid dreams. These crafty chairs and table will make you glad you lugged home buckets full of ocean goodies from your last beach trip. We've also seen shells used for bathtubs, sinks, even fountains. When you ask a fairy if she'd like a "spot of tea", you'll really mean it: you can't fit much more than a drop in this simply genius tea set. Kids will love dreaming up all the flavors they can serve from dandelion to basil-sunflower to (my kids' favorite) clover stew.